Republican Leaders Dismiss Obama's Tax Proposal As 'Not Serious' : The Two-Way House Speaker John Boehner, Senate Majority Leader Mitch McConnell and others have rebuffed the president's plan to cut taxes for middle income earners by raising them on the wealthiest Americans. House Speaker John Boehner listens as President Obama speaks to media during a bipartisan, bicameral leadership meeting at the White House this week. 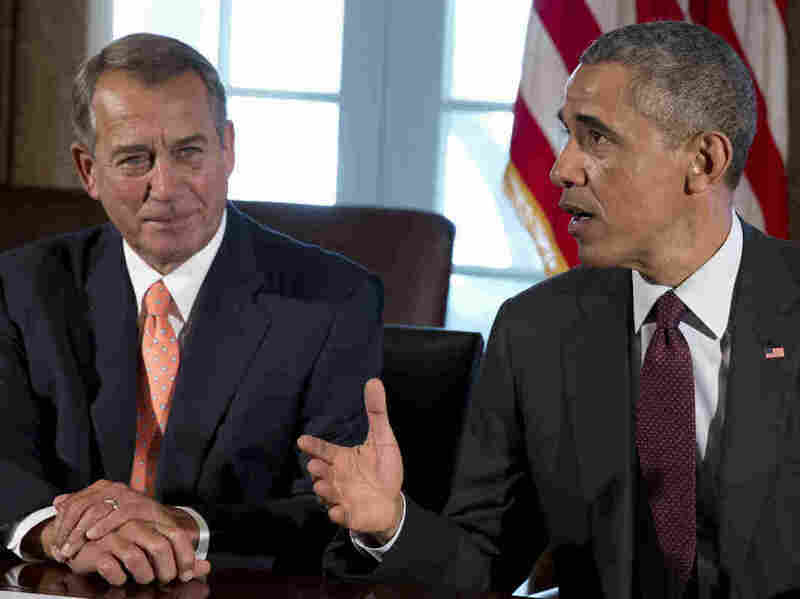 Boehner and others have reacted dismissively to Obama's tax overhaul plan. Republicans are firing back at a White House proposal to push tax cuts for middle income families by raising the capital gains tax rate on couples making more than a half-million dollars a year. As we reported on Saturday, the proposal, expected to be outlined in the president's State of the Union speech on Tuesday, would increase the tax paid on profits from the sale of property or investments to 28 percent from the current 23.8 percent rate. It would also require estates to pay capital gains tax on inherited securities, closing what the White House calls "one of the biggest tax loopholes" in the current code. "More Washington tax hikes and spending is the same, old top-down approach we've come to expect from President Obama that hasn't worked," a spokesman for House Speaker John Boehner said. "Republicans are offering better solutions focused on helping small businesses grow and hire, and helping families improve their lives," Michael Steel said. In the Senate, a spokesman for Majority Leader Mitch McConnell echoed the sentiment of many in the GOP who have long opposed what they have described as the president's goal of "redistributing wealth." The president has said that the nation needs to work to close the growing gap in wealth and income between rich and poor Americans. Don Stewart, deputy chief of staff for the Kentucky Republican said: "It's not surprising to see the president call for tax hikes, but now he's asking Congress to reverse bipartisan tax relief that he signed into law." Stewart said that "Republicans believe we should simplify America's outdated tax code; that tax filing should be easier for you, not just those with fancy accountants; and that tax reform should create jobs for families, not the [Internal Revenue Service]." The White House says the move would raise $200 billion over the next decade to expand tax credits for families in which both spouses work, expand the child tax credit to $3,000 per child under 5 years of age and overhauling the education tax system by providing students up to $2,500 a year to cover college tuition. While the plan enjoys almost zero chance of passing either the House or Senate, both now controlled by Republicans, the move by Obama is seen as a shot across the bow of the GOP in the lead-in to the 2016 presidential race. In what appeared to be an effort to blunt Republican criticism, the administration points out that the change in the capital gains rate would bring it back to where it was "under President Reagan." A spokesman for Rep. Paul Ryan (R-Wis.), chairman of the House Ways and Means Committee, also dismissed the president's proposal. "This is not a serious proposal," said Ryan spokesman Brendan Buck in a public statement. "We lift families up and grow the economy with a simpler, flatter tax code, not big tax increases to pay for more Washington spending."